186 pages | 51 B/W Illus. 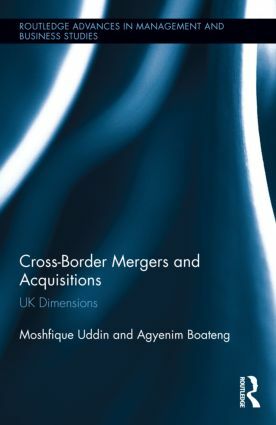 Cross-border mergers and acquisitions (CBM&As) activity has become an important vehicle for firms’ internationalization and corporate restructuring over the past three decades. Despite the huge volume of global CBM&A activity, however, there are few books which carefully explore the strategies, motives, and consequences of global mergers and acquisitions. This book discusses and synthesizes the theoretical literature on the motivation and performance of international merger activities. Focusing on the UK as a top acquiring country in the European Union, the authors explore the recent trends in cross-border mergers and acquisitions, motives for cross-border mergers and acquisitions, the mergers integration process, home and host countries’ macroeconomic consequences on mergers and acquisitions, and shareholder’s wealth effects on CBM&A. This book explores and sheds much-needed light on the UK CBM&A market, what drives it, and what lessons can be learned for other regions around the globe. Moshfique Uddin is a Senior Teaching Fellow in Accounting and Finance at Leeds University Business School, UK. Before joining at Leeds University Business School, he was Lecturer in accounting and finance at University of York and Leeds Metropolitan University, UK. He completed my Ph.D. in the area of cross-border mergers and acquisitions, has published in the area of mergers and acquisitions, and is currently doing research in the area of empirical finance. Agyenim Boateng is a Professor of Finance & Banking at Glasgow Caledonian University, UK. He received his PhD in Economics Studies from the University of Leeds. He has published in a number of international Journals including: Journal of International Financial Markets, Institutions and Money; International Journal of Accounting, International Business Review, Management International Review and Journal of International Financial Managent and Accounting. Management and business studies are firmly established as a popular, important and significant area of study in the academic world. Bringing together theories and thought from a wide range of disciplines, this series features cutting -edge research addressing all the major issues in business and management today, helping to define and advance the field.